Imagine you’re a bright 17-year-old. After two years of sweating at GCSEs, trying to get the obligatory 11 shining A*s, you sit AS levels. Perhaps you’re a little burnt out; perhaps, as is common at this stage, you’re taking subjects — economics or philosophy, say — you’ve never studied before. Anyway, your AS grades aren’t the greatest. Bunch of Cs. Disappointing but not the end of the world: you can retake all your AS modules next year with your A2s to improve your grades. But what if your school, like St Olave’s grammar in Bromley, says: not good enough, get out. No speckles on our apples: we can’t be seen to produce mediocrities like you. So at 17 it’s goodbye to teachers who understand your strengths, to the friends you’ve known since you were 11, to enjoying end of school rituals with your old gang. Let’s hope you can find another local school willing to take you that uses the same exam boards and syllabus. Let’s hope you can get through the rejection and upheaval, on top of those poor grades, to pull yourself together by next June. 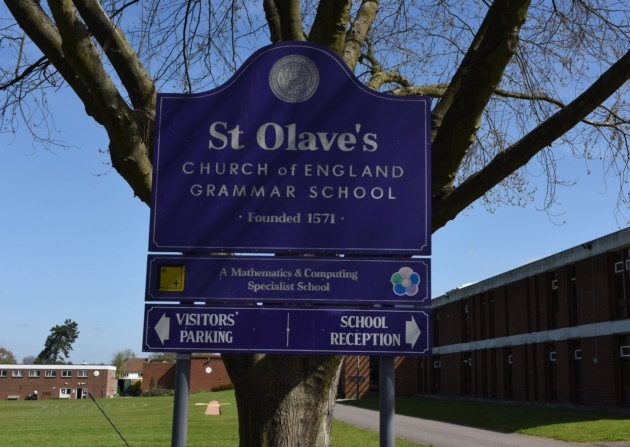 What St Olave’s did is nothing new. Private schools ruthlessly eject less starry pupils to preserve their precious league table place and prestige. But a state school doesn’t have to worry about attracting fees. So what does it say about us as a society that our public educators, entrusted with guiding children through the hard terrain of adolescence safely towards adulthood, care more about their ranking on a government chart than about ruining a young person’s life? I hadn’t planned to watch Bake Off in its new Channel 4 manifestation. This is the ultimate comfort TV and I was worried the new cast would upset the blood-pressure-lowering familiarity. But it wasn’t just the new presenters (particularly Prue Leith) who were more than passable substitutes. The main thing was that the contestants were exactly the same: they all showed a kindness in competition, sense of humour in failure, self-deprecation in triumph which are the finest traits in our national character. Bake Off also made me realise how seldom I have to watch adverts these days. Prue Leith got into trouble by suggesting we record the programme and fast-forward through messages from sponsors. And that is what everyone will do next week, although this staggered viewing does rather ruin the shared national moment. Yet years ago ads were themselves shared events: the Smash aliens, the Black Magic man, etc. Now I record everything to watch it later, skip ads on YouTube clips, install ad blockers, time my arrival at the cinema to avoid the ad reel. Am I fooling myself in believing I am almost beyond advertising’s reach? A friend was invited to a hen party with a difference: all the women had to come dressed as men. There was a variety of costumes from sheikh to Del Boy, but the most popular trend was facial hair. My friend, a lesbian, bought herself a vast and enviably lush beard which she wore with lashings of eye make-up and jewellery. This combination, she reports, had an oddly magnetic effect on the straight women. Likewise when this rowdy group came across a stag night, another woman wearing a huge handlebar moustache was very popular with the men. Perhaps the cheeky, flirtatious bearded lady is the sexual equivalent of salted caramel: it triggers all the taste buds at once.